WASHINGTON (AP) — President Donald Trump’s confidant Roger Stone has been charged with lying about his pursuit of Russian-hacked emails damaging to Hillary Clinton’s 2016 election bid. Prosecutors allege that senior Trump campaign officials sought to leverage the stolen material into a White House win. 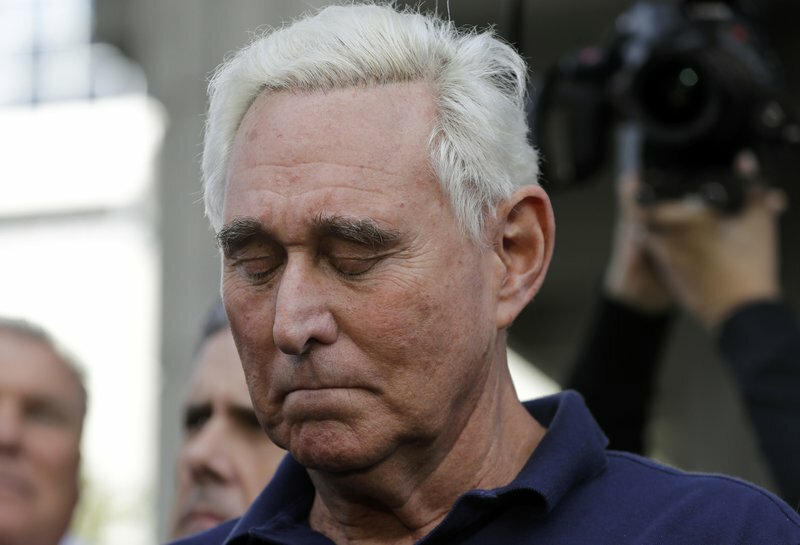 Known for his political antics, conspiracy theories and hard-ball tactics, Stone has reveled in being a Washington wheeler-dealer dating back to former President Richard Nixon’s administration. On Friday, he mimicked Nixon’s famous “V″ gesture as he left the courthouse. While the indictment provides some new insight into the Trump campaign, it deals largely with what prosecutors say were Stone’s false statements about his conversations about WikiLeaks with New York radio host Randy Credico and with conservative writer and conspiracy theorist Jerome Corsi, who rejected a plea offerfrom Mueller last year. The indictment says Stone carried out a “prolonged effort” to keep Credico from contradicting his testimony before the House intelligence committee. During that effort, prosecutors note that Stone repeatedly told Credico to “do a ‘Frank Pentangeli,’” a reference to a character in “The Godfather: Part II” who lies before Congress.